Dotsub is a browser based, one-stop, self contained system for creating and viewing subtitles for videos in multiple languages across all platforms, including web based, mobile devices, and transcription and video editing systems. This is great addition to the form if you want to show or explained something to the users around the globe while they are filling your form. 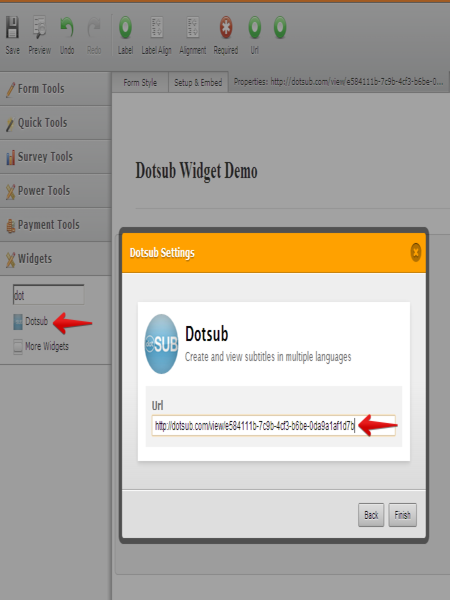 Embedding Dotsub Video to your form is now very convenient using this widget. Just drag Dotsub Widget to your form, enter the DotSub Video URL and you're done. It's pretty easy isn't it?